Wallpaper is often a design element and tool that is completely underrated. Yet, it can add charm, personality and style to any room in your home quickly, conveniently and most importantly, cost-efficiently. Forget the plain and old-fashioned wallpaper that grandma used to use in the bathroom, today at homify, we are going to show you a variety of different types of wallpaper that will inspire you to re-examine it as a tool for design and decor. 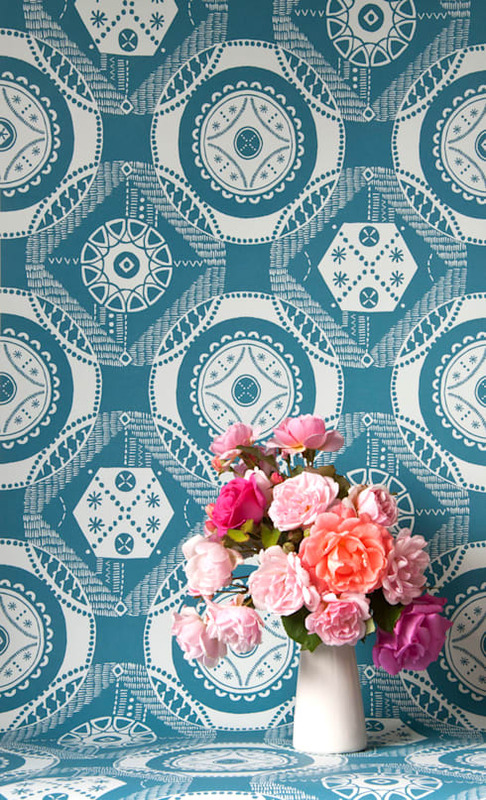 In fact, we are pretty certain that today's designs will have you contemplating whether to paper your walls! Forget neutral colours and Scandinavian design – let's go all out! In this bedroom design, we can see how a bold wallpaper design can enhance a very minimalist style, creating a space that is innovative, warm, inviting and, of course, original. Bold colours such as red and grey also work so well together so don't worry about opting for deep and vibrant colors when it comes to wallpaper. The wonderful thing about wallpaper, apart from how easy it is to apply to a wall as well as how budget-friendly it can be, is the patterns, shapes and geometrical shapes it can introduce to a home. In this design, by professionals Kate Farley, we can see how this blue patterned wallpaper completely enhances this space. It is further emphasized by the vase of flowers in this room, which offsets the lines, patterns and colours. Wallpaper is wonderful in that it can reinforce a theme in a certain area of the house. Use it to emphasize the beauty and warmth of a kitchen or the diversity and creativity of a dressing room. Wallpaper can also enhance a bathroom, bringing in a meditative and serene ambiance. Just stick it up and you can transform the whole space. Have a look at this ideabook: can I really use wallpaper in the bathroom? 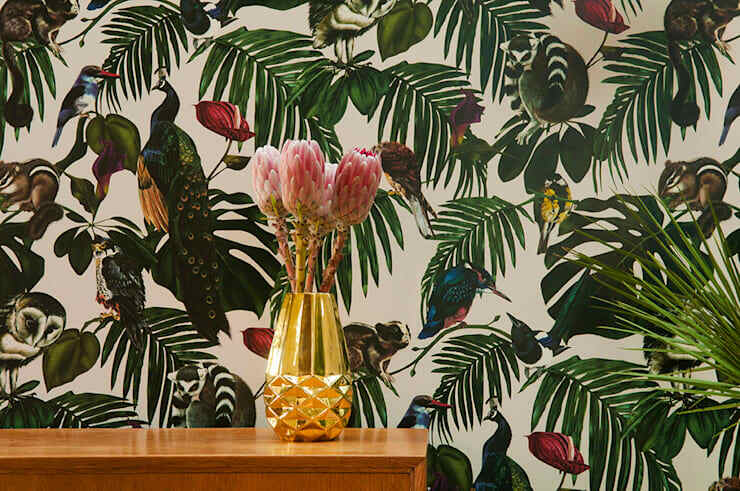 Add some fun and creativity to a room in your house by going for a tropical style. You can achieve this look by opting for vibrant coloured furniture, bold vases of flowers or a gorgeous wallpaper design that enhances the entire space. In this design, we can see how the wallpaper becomes the focal point of the room, allowing the rest of the furniture in the space to remain neutral and subtle. Have a look at this holiday home with a tropical vibe, to see what we are talking about. Allow certain rooms in your home to transport you to new worlds with your choice of wallpaper. 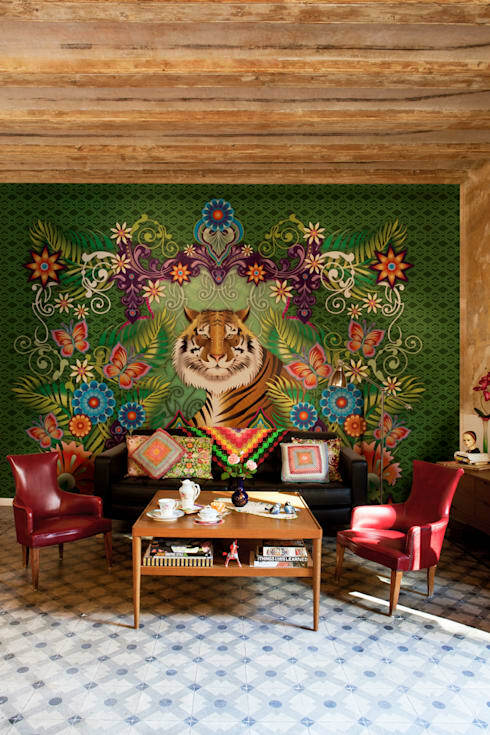 In this living room, the neutral coffee table and red sofa and armchairs are completely illuminated by the eye-catching piece of wallpaper above it, which features rich colours and the portrait of a tiger. Remember that your home is an extension of who you are, so don't be afraid to express your creativity and your personality through your wallpaper. 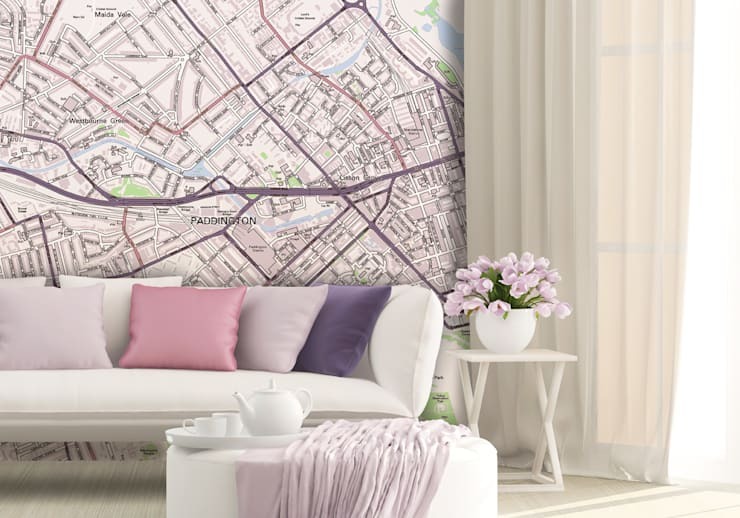 Use your wallpaper to put a map on a wall in your home, which will add a bit of unique design and decor the space. It may also remind you of your home town, your favorite city or some the places that you've visited. The other incredible feature of wallpaper is how it can be used to create a whole memory wall in your home, reminding you of your favorite moments and your favorite people. In this design, we can see how a collage has been created with photographs – the most ideal wallpaper! 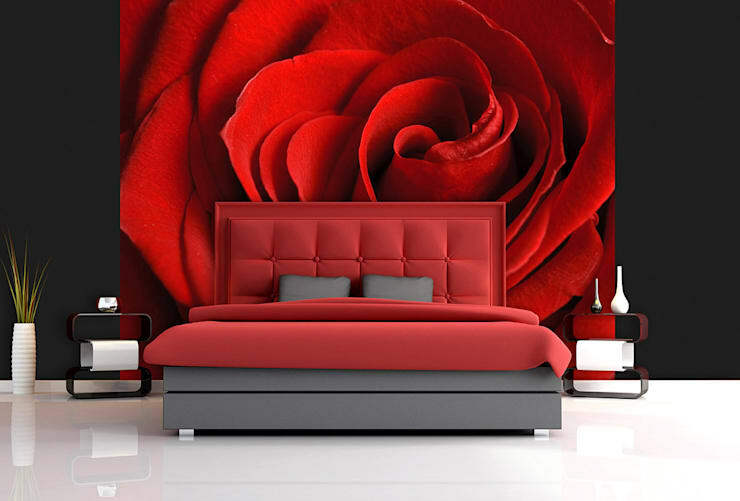 This is a gorgeous design for a wall in the living room or the bedroom. Tip: If you are going to go for this option, choose to only wallpaper one wall in the room as opposed to all of them. You don't want the space to become too overwhelming. If you can't afford a gorgeous stone facade or that log wall that you've been dreaming about, why not add a piece of wallpaper to the space like this one, which adds that rustic yet homely touch to the space. This is the ideal type of wallpaper to apply above a fireplace or in the library section of the home. 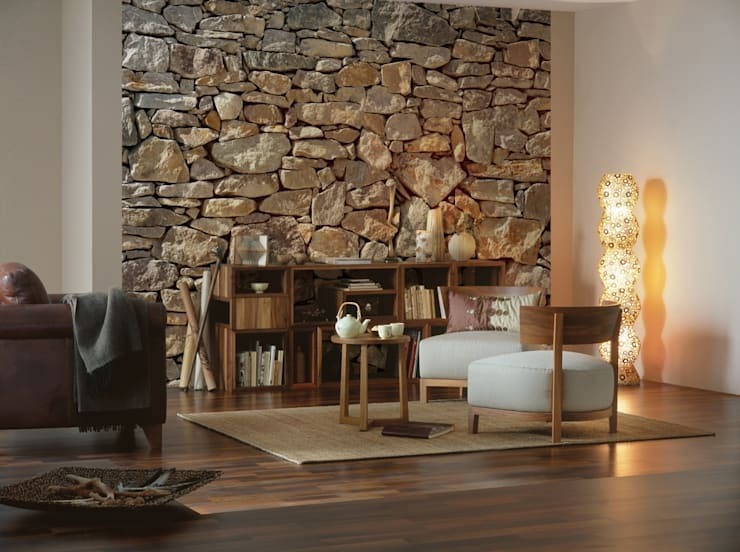 The great thing about this wallpaper, is that it creates the illusion of a stone facade! Last, but certainly not least, wallpaper can add character and charm to your kid's bedroom. 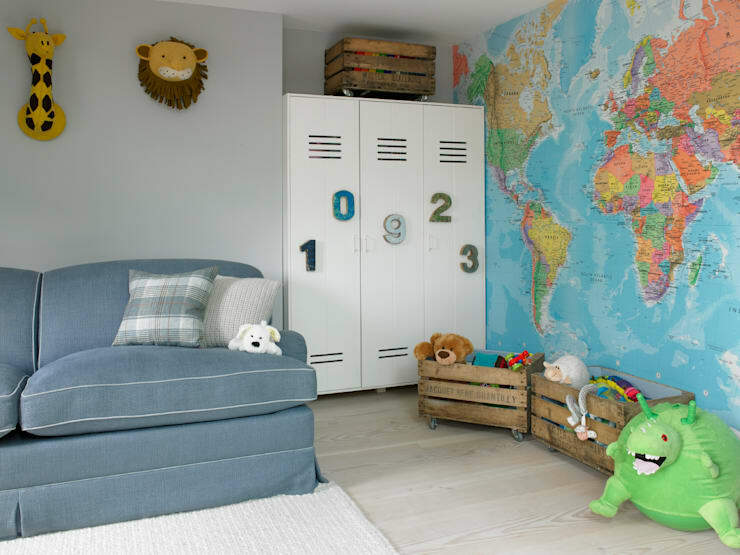 It doesn't matter what colours they are into, what their favorite cartoon is or if they are still learning the alphabet, wallpaper can suit their styles and interests. We all know how quickly kids grow out of their interests, however. The great thing about wallpaper is how easy it is to replace, creating a whole new look and feel for the space. Would you use wallpaper in your home?